The 2-year-old boy who died Sunday in a fire at his Wahiawa home was identified by the Medical Examiner's Office as Nathaniel Nunes. Nunes died from heat burns and carbon monoxide inhalation, the Medical Examiner's Office found. Neighbors said the boy was sleeping in a back bedroom at the time of the fire at 284 California Ave. Firefighters arrived at about 2:34 p.m. within minutes of when it started. Three other young children and the boy's mother and grandmother escaped unharmed. The Fire Department estimated damage to the building and contents at $80,000. Fire investigators are still trying to find the cause. Police are also investigating the child's death. 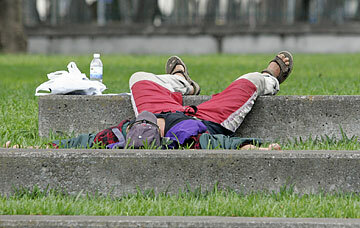 A man made himself comfortable yesterday on the grounds fronting the Hawaii State Library. The Honolulu Centennial Family Festival will go on, after being canceled because of heavy rains last weekend. The festival, part of the City and County of Honolulu's 100th-birthday celebration, will run 5 to 11 p.m. Thursday, 5 p.m. to midnight on Friday, noon to midnight Saturday and 10 a.m. to 8 p.m. Sunday. E.K. Fernandez rides and games, food and live entertainment will be available. For more information, call 275-3030 or visit www.honolulupride.com. » The Arizona Memorial Museum Association has received $5,000 from the First Hawaiian Bank Foundation to develop educational and interpretive programs at affiliated Pacific-area historic parks in Guam and Saipan. » The Office of Hawaiian Affairs has awarded four community groups more than $500,000 in grants, including Global Medilink Technology Inc., $164,658 for the Hawaii Oral Health Outreach Project Phase II; Hui o Kuapa, $87,570 to provide a site on Molokai for a hands-on "classroom without walls" using fishponds and ahupuaa (mountain-to-sea) resources; Nanakuli Housing Corp., $187,658 for site renovation of a facility and workshop for home repair and handyman training; Waikiki Health Center, $85,840 to expand the Ho'ola Like Outreach Program to provide health services, focusing on diabetes management. » L&L Drive Inn has donated $1,000 in proceeds from its 76-cent plate lunch event in February to Goodwill Industries of Hawaii to support Goodwill's job placement and career development social service programs. Police are looking for a man who allegedly tried to run down a man who tried to stop him from leaving the scene of an accident. Police said that at about 1 p.m. Saturday, a man crashed a late-model white vehicle into a car parked on the street in Ewa Beach. A witness, 32, tried to stop the driver from fleeing the scene, and the driver tried to run him down, police said. The witness was not hurt, police said. The driver was described as a man in his 30s, police said. Police are asking for the public's help in recovering some expensive dental equipment stolen last week from a car in Makakilo. The break-in happened sometime between 5:30 p.m. last Tuesday and 5 a.m. Thursday in a parking lot at 92-1144 Hame St. Police said the victim parked the car last Tuesday, and when he returned two days later, he found that someone had taken high-tech dental equipment valued at $48,366 that he had left in the trunk. Anyone with information about this case is asked to call CrimeStoppers at 955-8300 or by dialing *CRIME on a cellular phone. Police arrested a 29-year-old Waianae man Sunday on suspicion of auto theft, among other offenses, after he was driving without headlights. A patrol officer spotted the man allegedly pulling out on Maipela Street without any headlights, police said. The officer stopped the driver and noticed the vehicle identification number had been tampered with, and upon further checks learned the car was stolen. The car was a 1990 Honda two-door sedan stolen from Waipahu. The man was arrested at 10:54 p.m. Sunday at Farrington Highway and Maipela Street. In addition to auto theft, police also arrested the man on suspicion of defacing a serial number plate, fraudulent use of license plates and driving without headlights, along with three warrants. Security video shows a burglar was responsible for starting a small fire at Kailua Sailboard and Kayak Inc. last month. Police said the video shows a man entering the shop at about 4 a.m. March 20 and taking two LCD monitors used to show safety videos. At some point the burglar noticed the camera and covered it with a cloth, which eventually caught on fire. Fire Department personnel and police responding to the scene discovered the burglary. Police are now looking for a man described as having a shaved head, mustache and wearing a dark T-shirt. Anyone with information on this case is asked to call CrimeStoppers. Police arrested two men after they allegedly raped a 26-year-old woman at a Laie beach Saturday. The incident took place at about 3:15 p.m. at Hukilau Beach Park and allegedly involved acquaintances of the victim. Police arrested the men, ages 23 and 26, for investigation of first-degree sexual assault and kidnapping. 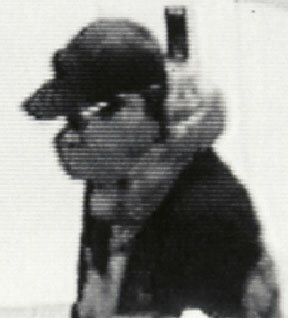 This man robbed the Hobron Lane branch of Bank of Hawaii on Thursday. Police are looking for a man who robbed a Waikiki branch of First Hawaiian Bank last week. At about 1:30 p.m. Thursday, police said, the man entered the bank at 444 Hobron Lane, brandished a knife and demanded money. After receiving an undisclosed amount of cash, he fled the scene. The suspect is described as between 30 and 40 years old, about 6 feet tall, between 160 to 180 pounds, unshaven and with straight, dirty blond hair. He was last seen wearing a red-and-black windbreaker, black pants, a red cloth mask and dark sunglasses. Anyone with information on this case is asked to call police or CrimeStoppers. Police arrested a 27-year-old man for allegedly punching another man in the face last month because he gave him "stink eye." Police said that at about 11:55 p.m. March 4, the suspect was driving near Piikoi Street and Kapiolani Boulevard when he spotted the victim, 18, sitting in a parked car and "eyeing him out." The suspect then allegedly pulled up alongside the victim's vehicle, got out and punched the victim's windshield and then punched the victim through the open driver's-side window. After the suspect fled the scene, two witnesses identified him to police. The suspect turned himself in to police yesterday and was arrested for investigation of unauthorized entry into a motor vehicle. » Kahala Mall reopens; Will insurance pay?